Let’s face it. If a given compact luxury car isn’t stamped with a three-pointed star, a set of four intertwined rings, or a blue and white roundel it’s going to have a difficult time getting noticed anywhere in Canada. Mercedes-Benz’ C-Class, Audi’s A4 and A5, plus BMW’s 3 and 4 Series pretty much own this highly contested market segment, which therefore leaves a slew of bit players squabbling over leftovers, but then again the models just noted are no longer the premium sector powerhouse combination they once were. Now the majority in this class are beleaguered by their own compact luxury crossover SUV brilliance, or more specifically, despite year-over-year sales of the BMW X3, for instance, being up a sizeable 48.6-percent from calendar year 2017 to 2018, deliveries of the once bellwether 3 Series were down 19.5 percent last year, and the significantly lower volume 4 Series off by 5.4 percent during the same 12 months. Not every D-segment car bled red ink, mind you, with the just noted C-Class up by 6.5 percent, the Infiniti Q50 gaining 6.8 percent of additional ground, and Audi’s A5 improving its sales by an astonishing 25 percent, albeit after a complete overhaul relieved pent-up demand. As you may imagine, some other some rivals experienced a great deal more contraction than the BMW 3 Series during 2018, including the Lexus RC that saw its sales plummet by a shocking 37.9 percent, plus the Jaguar XE which fell by 27.8 percent, the Cadillac ATS that was off some 25.4 percent, the Acura TLX that dropped 25.2 percent, the Infiniti Q60 which was under water by 24.2 percent, and the Audi A4 having slipped backward by a surprising 20.3-percent. Such massive losses make the two Volvo 60 series models’ slight downturn of 5.1 percent appear much less significant, and to shed yet more light on why they dropped in year-over-year popularity, the V60 sport wagon experienced such amazing growth from 2016 through 2017 (the old S60 sedan was part of these numbers as well) at 99.7 percent, dipping slightly the following year was inevitable. Still, measuring success in this segment has less to do with modest gains in sales percentages as it does with sales volume, and to that end both 60-series Volvos were only able to lure in 1,245 Canadian buyers collectively through all of 2018, which pales in comparison to the 11,556 C-Class sedans, coupes, convertibles and wagons sold into this country, or the 10,173 Audi A4 sedans and crossover wagons, that number also including A5 convertibles plus two- and four-door coupes, and lastly the 9,733 BMW 3 Series sedans and wagons, and 4 Series’ convertibles plus two- and four-door coupes. All others were a far cry less popular, with Infiniti’s two models combining for 3,424 units, the duo of Lexus cars (excluding the ES) managing to attract just 3,163 takers, the Acura TLX earning only 2,397 deliveries, and the soon to be discontinued Cadillac ATS luring in 1,615 new buyers, while far below the Volvo 60 series cars was the new Genesis G70 that found 967 new owners, the Jaguar XE with 571 out the showroom door, and finally the Alfa Romeo Giulia with just 510 units down the road. Such talk might possibly cause you to forget about any other D-segment brands than Mercedes, BMW and Audi, but I recommend taking a step back and considering some of the others on offer, because just being popular doesn’t necessarily translate into better. In fact, you may find the new 2019 Volvo S60 matches your personal taste and fulfills your lifestyle to a much greater degree. There was once a time that Volvo was respected first and foremost for safety, followed by stalwart durability, and while such worthy traits are still high on the luxury brand’s list of attributes, the former most recently verified by IIHS Top Safety Pick and Top Safety Pick Plus ratings for two of its more recently redesigned models, as well as its host of standard advanced driver assistance features such as Driver Alert Control, automatic front collision warning, full low- and high-speed autonomous emergency braking, steering support, Run-Off Road Mitigation, lane keeping assist, and Oncoming Lane Mitigation, plus all the expected active and passive safety items, even including a driver’s knee airbag, front whiplash protection, and pyrotechnical seatbelt pretensioners in all seating positions, there’s a lot more to the brand’s desirability now than ever before. Before getting into that, I wanted to point out what Oncoming Lane Mitigation is referring to. If the new S60 sedan’s sensors detect a head-on collision, the new oncoming braking system will automatically activate full braking force a mere two-tenths of a second before impact, resulting in vehicle speed reduction of 10 km/h before impact, says Volvo, which could potentially save lives, or at least minimize injuries. On top of the S60’s list of non-safety and durability attributes is styling, but this said I’m not going to delve into design very much this time around, because the new model’s full LED “Thor’s Hammer” headlamps have been discussed ad nauseum in all of my recent Volvo road tests and news stories, as have the “hook” or C-shaped LED tail lamps now framing the backside of Volvo’s two new sedans. My personal preference with respect to overall styling leans more toward the sportier S60 when put up against the previously reviewed S90, but I think both Volvo four-door models look great, measuring up to, and in some ways surpassing their aforementioned rivals. So how does the new S60 fit into its D-segment dimensionally? It’s been given a dose of steroids compared to the second-generation 2010–2018 model it replaces, now measuring 133 millimetres (5.2 inches) longer from front to back at 4,761 millimetres (187.4 inches), while its wheelbase has been lengthened by 96 mm (3.8 in) to 2,872 mm (113.1 in). This said the new car’s width is down some 15 mm (0.6 in) to just 1,850 mm (72.8 in), plus its roofline has been lowered by 53 mm (2.1 in). Rear legroom is the direct benefactor of the longer wheelbase, resulting in a back seating area that’s much more spacious than it was before, with room to move around and wonderfully comfortable outboard seats boasting superb lumbar support. 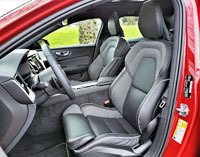 The comfort quotient is even more pronounced up front, where my R-Design trimmed tester was fitted with six-way power contoured sport seats featuring four-way power-adjustable lumbar that easily found my lower back’s sweet spot. What’s more, the driver’s seat includes a power-activated extendable squab that ideally cupped under my knees for even more support and comfort. Standard two-way memory made it easy to get back to a previously chosen seat setting, but one of my favourite R-Design seat features was the Fine Nappa leather covering all positions from front to back, highlighted by sporty contrast stitching that matched yet more off-white thread throughout the rest of the cabin. As sharp as the seats look I don’t think they’ll be first to grab your attention when sitting behind the wheel, because the S60 R-Design interior is so impressive you’ll be more likely to get distracted by its contemporary yet classically luxurious take on design, not to mention all the brilliantly detailed metal accents and plush surfaces. Unique to the R-Design is a three-spoke leather-wrapped sport steering wheel, metal sport pedals, R-Design branded floor mats, and R-Design etched metal door sills, while additional interior highlights include a black headliner, a large 12.3-inch TFT gauge package, a sizeable vertically-positioned centre touchscreen featuring Apple CarPlay, Android Auto, navigation, and more, plus four-zone automatic climate control with nicely sorted rear controls, and the list goes on. I really like the R-Design’s unique Metal Mesh accents, and some of that switchgear mentioned earlier is downright jewel-like, particularly the sparkling ignition dial and rotating drive mode selector cylinder, the latter of which let’s you choose between Comfort, Eco and Dynamic settings. Truly, the eye-arresting opulence found in the new 2019 S60, which mirrors most new Volvo models, will be sure to wow anyone moving up from their old S60, let alone one of the cars it competes against. As mentioned in my V6 sport wagon review, I was fortunate enough to have it in my possession for three weeks over the Christmas holidays. It was kitted out in top-tier Inscription guise, which while a bit pricier than this R-Design, whether we’re talking that V60 or this S60, doesn’t get many more features. Inscription trim is simply a more luxuriously styled version of any Volvo model, whereas the R-Design designation reveals sport themed styling and performance, which leaves the Momentum as the base entry-level model, albeit very nice just the same. I expect Volvo will make its T8 AWD Polestar performance trim available for the S60 sometime soon as well, which in other models includes a plug-in hybrid powertrain that’s good for 400 horsepower and 400 lb-ft of torque thanks to its internal combustion engine being this S60 R-Design’s turbocharged and supercharged 2.0-litre four-cylinder. Both R-Design and Inscription models come standard with this top-line T6 AWD powertrain, while this potent combination is made optional with Momentum trim, which otherwise comes with Volvo’s standard T5 FWD powertrain in base guise. The lesser engine features the same 2.0-litre four-cylinder engine sans the supercharger, resulting in 250 horsepower and 258 lb-ft of torque, whereas the T6 AWD provides a more robust 316 horsepower and 295 lb-ft of torque. Each powertrain is made standard with automatic idle start/stop, a technology that helps minimize tailpipe emissions while reducing fuel consumption by temporarily killing the engine while the car is standing still idling. Together with a number of other efficiency features it helps the T5 FWD model receive a rating of 9.9 L/100km in the city, 6.6 on the highway and 8.4 combined, while this T6 AWD version is capable of 11.1 in the city, 7.3 on the highway and 9.4 combined. I don’t know about you, but I was a lot more interested in how the S60 R-Design drove than how little fuel I could get away with using, despite what seem like never-ending fuel price increases in my part of the world. Rest assured that it’s a lot more fun to pilot down a twisting two-lane country back road than my V60 Inscription tester was, not that the stylish sport wagon was a slouch by any sense of the imagination. Still, the S60 felt quicker in a straight line, thanks to fast-reacting all-wheel drive making the most of its sticky optional 235/40R19 Pirelli all-season rubber. Those meaty tires immediately found grip, allowing the potent little 2.0-litre powerplant to ramp up speed quickly, its eight-speed automatic gearbox an ideal compatriot, especially with Dynamic sport mode engaged. Despite its quick-shifting capability, the transmission was wonderfully smooth, while its steering wheel paddle shifters provided enough go-fast connectivity to keep my fingers in play. Adding to the fun, the S60 R-Design’s exhaust creates sonorous notes from behind when the throttle is pegged, yet is otherwise silent like the car’s well-insulated cabin. Truly, the S60 R-Design does a nice balancing act between sport and luxury. Likewise, the S60 R-Design does a commendable job straightening curves, due partially to lowered sport suspension that includes firmer shocks for stiffer, flatter handling through quick corners, resulting in a stable, predictable sport sedan even when hurled nonchalantly into hairpin curves, some of these corners off-camber and surfaced with uneven tarmac. I’ve taken some of the S60’s challengers through these sections and not all proved as agile, the S60 R-Design not getting unglued when flung back and forth through continual left, right, and left turns either. If you weren’t aware, the new S60 sits on Volvo’s SPA, a.k.a. it’s Scalable Product Architecture, which underscores the brand’s S90 luxury flagship sedan as well as the majority of its new models. SPA features aluminum double wishbones up front and a unique integral link design in back, the latter incorporating a transverse lightweight composite leaf spring. Additionally, the S60 includes driver-selectable low, medium and high personal power steering settings to aid feel, while the car’s brakes are a good match to its handling prowess and accelerative force, providing good binding power when stomped upon, as well as smooth progression no matter how hard, or soft, the centre pedal is pressed. Still, as capable as the S60 R-Design was at heightening my senses when extracting its full performance potential, it always kept its luxury sedan roots intact due to impressive ride quality and the superbly comfortable driver’s seat noted earlier. Ride and handling in mind, the S60 R-Design, priced at $52,400 plus freight and fees, normally rolls on 18-inch alloy wheels, while yet unmentioned features pulled up from its $42,400 base Momentum T5 FWD trim include rain-sensing wipers, Road Sign Information (RSI), an auto-dimming centre mirror, a powered panoramic sunroof, a Clean Zone Air Quality system, a humidity sensor, rear parking sensors, a backup camera with active guidelines, voice recognition, two USB ports, Bluetooth connectivity with streaming audio, Volvo On-Call featuring remote start and vehicle tracking, a 170-watt 10-speaker audio system, Sirius/XM satellite radio, heatable front seats with aforementioned driver’s side memory, a 120-volt three-pronged household-style power outlet in the rear console, power-folding rear seat headrests, plus more on the inside, while the exterior features dual chromed tailpipes across the entire line, plus this model gets a special R-Design front grille, auto high beams and active bending for the LED headlamps, fog lamps with active bending, glossy black exterior trim (including the side mirror housings), puddle lamps under the door handles, proximity keyless entry, etcetera. I particularly liked my test car’s beautiful coat of Fusion Red Metallic paint, an option well worth the extra $900. It’s one of five available colours and a single no-cost standard Black Stone hue, while all R-Design trimmed cars receive a Charcoal black interior theme. If you were to choose the base Momentum, the exterior paint selection grows to seven colours and available interior themes widen as well, while the Inscription upgrade gives you a choice of eight outer colours yet fewer cabin combinations, but take note the Momentum model’s upgradable upholstery options don’t cost anything at all when moving up to Inscription trim. The previously lauded 19-inch alloys were a $1,000 improvement by the way, while my tester’s additional options included a graphical head-up display that projected key info, such as route guidance directions, onto the windscreen for just $1,150; while its Bowers & Wilkins stereo came with 15 sensational speakers and 1,100 watts of over-lording power, making it a great way to spend $3,750. Additional extras included a Climate Package with heated Aquablades windshield wipers, a heatable steering wheel, and heated rear seats for $1,250; a Convenience Package sporting Volvo’s superb Pilot Assist semi-autonomous drive system, Adaptive Cruise Control, and a Homelink garage door opener plus compass integrated into the centre mirror for $1,500; and lastly a Vision Package incorporating a wonderfully useful 360-degree surround parking camera, easy-to-operate Park Assist Pilot semi-autonomous self parking, always appreciated front parking sensors, even more welcome auto-dimming power-retracting side mirrors, plus blindspot monitoring with rear cross traffic alert for $1,800. Those curious about the S60 Inscription should note that it includes almost all of the R-Design model’s features for just $53,900, except for the sporting items spoken of earlier in this review. Unique to this model is an elegant chrome waterfall-style front grille, bright metal window surrounds, special 10-spoke 18-inch alloys, gorgeous matte Driftwood Décor interior trim, a tailored dash top and instrument panel featuring more stitched soft padded surfaces than other models, whereas the seats are upholstered in rich perforated Nappa leather, and come ventilated up front. By the way, all pricing was pulled from right here at CarCostCanada, where you can also source individual trim, package, and standalone option pricing, plus rebate information and money-saving dealer invoice pricing that’s otherwise hard to get. Speaking of hard, the new S60 made it difficult to find anything to gripe about, but I would’ve appreciated somewhere to stow my sunglasses, and there wasn’t enough room on the lower console to rest my Samsung S9, which was likely part of this company’s safety-first plan from the onset, so I probably shouldn’t complain. I nevertheless placed it in one of the S60’s two cupholders, which are otherwise covered under a beautifully detailed retractable lid, with the other cupholder was amply large to securely hold a sizeable water bottle that almost never leaves my side. I should also note that the trunk, which at 391 litres (13.8 cubic feet) is average for this segment, was big enough for all of my daily gear, but its 60/40 split-folding rear seatbacks only included a centre pass-through instead of a more accommodating 40/20/40 opening, so while I could probably fit a couple of sets of skinny skis through I wouldn’t be able to squeeze in a duo of fat powder boards or enough skis for four passengers. Still, even this narrow pass-through is a big improvement over most of its Japanese challengers that simply provide 60/40-split seatbacks with nary a centre slot to be seen at all. In summary, if you’re contemplating a car in the compact luxury D-segment you should seriously consider this all-new Volvo, as the S60 is now a commendable contender that provides attractive styling, serious performance, leading-edge technology, impressive safety, and a level of comfort that really needs to be experience to be appreciated. What’s more, the new S60 is totally unique in this class, which has to account for something, right? After all, who wants to be seen in a car that everyone else drives? I certainly appreciated not witnessing exact duplicates of my ride passing by day in and day out, and enjoyed the quick head-turns and positive smiles my S60 R-Design tester received throughout my test week. Truly, if I were in this market, I’d have a hard time turning this wonderful car down, but alas, like most everyone else these days I’m trying to decide between SUVs. What can I say? I’m a product of the times. If instead you’re into something more exclusive, check out this all-new Volvo S60. I highly recommend it. If you think the auto industry has given up on cars and is only relying on SUVs to turn a profit, look no further than the thoroughly reinvigorated Volvo brand and its wonderfully renewed lineup of sport wagons and crossover-styled variations on the same five-door theme. The first to arrive was the beautiful new V90 and V90 Cross Country duo, both having respectively replaced the old V70 and XC70 for the 2017 model year, albeit the former hasn’t been with us for a decade or so. Fast forward to 2019 and Volvo’s wagon lineup just expanded with all-new 2019 V60 and V60 Cross Country crossover models, and thanks to Volvo’s Canadian PR team leaving the sportier of the two in my driveway for three weeks last month we’ll be starting off closer to the ground. I suppose this is as good a time as any to talk powertrains, being that both V60 models incorporate Volvo’s innovative 2.0-litre four-cylinder engine, the T5 featuring turbocharging and the T6 adding the just-noted supercharger to the mix. The former makes a laudable 258 horsepower and 250 lb-ft of torque for thoroughly enjoyable performance from standstill up to highway speeds and beyond via eight quick-shifting automatic gears and standard all-wheel drive, whereas the latter puts 316 horsepower and 295 lb-ft of torque down to the road via the same all-wheel drivetrain. By the numbers, the V60 T5 AWD allows for an energetic zero to 100km/h sprint of 6.6 seconds and a top speed of 225 km/h (140 mph), whereas the T6 AWD cuts standstill acceleration runs down to 5.7 seconds while upping maximum velocity to 249 km/h (155 mph). Volvo’s T6 engine seems to make a more sporting note at full throttle than I last remember, while the zero-to-100 times quoted a moment ago feel as good as they look. The drivetrain is especially engaging when set to Dynamic sport mode via the jeweled switch on the lower console, which heightens the performance of all controls. Bend it into a sharp, fast-pace curve and the V60 immediately takes on the role of unflappable sport wagon, providing an adept level of poise that almost seems too capable when simultaneously taking in its luxurious Inscription-trimmed surroundings. The V60’s cabin is absolutely stunning, which caused me to leave the drive mode selector in Comfort more often than not, and Eco when I was paying attention, which together with auto engine start/stop provided best-possible fuel economy at a claimed 10.9 L/100km city, 7.7 highway and 9.5 combined with the as-tested T6 AWD, or alternatively 10.2, 6.8 and 8.7 for the less potent T5 FWD, and made the most of the impressively smooth ride and wonderfully quiet cabin, ideal for such resplendent accoutrements. As already executed to near perfection in the crossover SUV classes, Volvo once again creates the D-segment leader for interior design and execution thanks to the highest grades of materials and the finest attention to detail. From its myriad soft-touch surfaces above the waistline and below, including plush perforated leathers, to its beautifully executed decorative metal accents and matte hardwood inlays, the V60 Inscription provides a richness and elegance that’s been sorely missing from this more compact five-door luxury category. Then there’s comfort, which has always been Volvo’s strength. The Inscription seats are superb, and that’s even before making the myriad adjustments they allow for. The seat squabs extend forward, cupping below each knee, while the backrest side bolsters power inward or outward to fit most any body type, whether you want a snuggly hug or more relaxing support. Support in mind, four-way powered lumbar means you can position extra lower back pressure just about anywhere you want it, but surprisingly not all models the V60 competes against offer four-way powered lumbar. Then again some offer powered steering columns, which is not available with the V60, so therefore the Inscription’s two-way memory settings don’t affect the steering wheel, but if it were one or the other I’d optimize seat comfort and control. Looking forward, the gauge cluster is digital, which is nothing new for the V60 that along with its S60 sibling was one of the first cars in its class to offer a colour TFT display in place of the usual analogue primary instruments. Still, this 12.3-inch driver display, upsized from the base Momentum trim’s 8.0-inch unit, is a much more advanced bit of kit than the old V60’s. In fact, it takes up all available space below the instrument hood, and even better it defaults to the navigation system’s colour map that features 3D building block graphics that are fabulous fun to watch when tooling amongst the high-rises of any downtown core. Of course, that map can be shown over on the V60’s standard 9.0-inch vertical centre touchscreen, Volvo’s Sensus interface continuing to be one of the best in the industry. It’s not that it wows with bright colours and exciting graphics, but rather because it’s more tablet-like than any of its rivals and therefore is easier to figure out. It features Apple CarPlay and Android Auto smartphone integration, all of the usual gesture controls, 4G LTE in-car Wi-Fi, responds 50 percent faster than earlier versions, although my tester’s otherwise excellent 360-degree surround parking camera was a bit lethargic at startup resulting in fashionably late appearances after I’d finished reversing out of my driveway when leaving in a rush, and thanks to an upgrade to the $3,750 optional 19-speaker 1,400-watt Bowers & Wilkins audio system provided sensational sound quality, while the satellite radio colour album cover graphics were wonderful. Those speaker grilles are surrounded by some of the only hard composite in the entire car, the rest of each door panel soft touch synthetic from top to bottom, excepting the armrest that’s covered in contrast-stitched leather. Likewise for the centre armrest/bin lid, the front edge of the dash top, and the instrument panel just below, which is why I was a bit miffed that Volvo chose not to finish the glove box lid to the same standard, leaving it hard plastic in a segment that normally softens this surface. Volvo leaves the sides of the centre console hard plastic too, but this is more than made up for by a beautiful set of satin-silver framed matte hardwood scroll-top lids for the connectors, tray and cupholders below. Volvo chose not to add the same wood to the doors, but surrounding the steering column and just ahead of the front passenger are lovely sculpted sections next to an equally artistic inlay of flowing satin-silver aluminum, the V60’s interior design coming across much more zen-like than anything from Japan, or Germany for that matter. For one, the V60 is spacious. In fact, I think the new V60 is targeting previous V70 customers just as much as those who loved the outgoing V60, thanks to 124 mm (4.9 inches) more length overall, plus a 9.6-mm (3.8-inch) longer wheelbase that results in the most spacious rear seating area in the luxury D-segment. The new model is 51 mm (2.0 inches) lower than its predecessor too, which adds to its long, sleek visual stance, but nevertheless it provides ample headroom and legroom for a six-foot passenger behind a six-foot driver, although I wasn’t able to substantiate this claim due to my previously noted five-foot-eight height. Nevertheless, I can attest to an obvious increase in cargo space, the new V60 boasting 20 percent more than the outgoing car. Reason enough for its growth is Volvo’s new Scalable Product Architecture (SPA) that also underpins the larger V90 sport wagon, not to mention everything else in today’s Volvo lineup other than the compact XC40 crossover. Everything riding on SPA gets regularly praised by owners and auto pundits alike, with aforementioned ride-quality and quietness given near universal accolades, so it only makes sense the V60 delivers to the same high level. I’ve touched on features throughout this review, but have yet to go into trim details, so without further adieu the base 2019 V60 Momentum T5 FWD starts at just $43,900 plus freight and fees, which is only $50 above than last year’s base V60 yet includes standard LED headlamps, rain-sensing wipers, a powered panoramic glass sunroof, dual-zone auto climate control, leather upholstery, power-adjustable heated front seats with driver’s memory, a powered liftgate, power-folding rear seat headrests, power-folding rear seatbacks with controls in the cargo compartment, a semi-automatic cargo cover that conveniently slides up and out of the way when opening the tailgate, and much more. Of course, plenty of safety gear comes standard too, including standard City Safety automatic front collision warning with full low- and high-speed autonomous emergency braking, plus Driver Alert Control, steering support, Run-Off Road Mitigation, Lane Keeping Aid and Oncoming Lane Mitigation, and more. Of special note, the new V60 introduces an Oncoming Braking system that, if sensing an imminent head-on collision will automatically actuate maximum braking force two-tenths of a second before impact. This is said to reduce vehicle speed by 10 km/h before impact, which could potentially save lives and certainly minimize injury. I won’t go into all standard and optional features available with Momentum or $55,400 Inscription trim, although if interested feel free to check out my previous story that covered everything in detail, but suffice to say the latter as-tested model gets a special chromed waterfall grille, cornering headlights, fog lamps, a really nice leather-wrapped and metal edged key fob, Power Steering Personal Settings with low, medium or high assistance, the gorgeous Driftwood decor inlays, digital gauge cluster and four-way powered lumbar noted earlier, Nappa leather upholstery that’s perforated for allowing through forced ventilation up front, etcetera. Option out a V60 Inscription T6 AWD and you can have the same $1,000 19-inch multi-spoke alloys as seen on my test car, the previously noted audio upgrade, $1,300 massaging front seats and a $1,150 graphical head-up display. Additionally, my tester included a $1,250 Climate Package with heated Aquablades windshield wipers, a much-welcome heatable steering wheel, and heated rear seats; a $1,500 Convenience Package with Volvo’s Pilot Assist semi-autonomous drive system that uses the Adaptive Cruise Control, Lane Keeping Aid and other advanced driver assistance features to keep the V60 within its chosen lane, plus a Homelink garage door opener and a compass; plus an $1,800 Vision Package with the aforementioned 360-degree surround parking camera, Park Assist Pilot semi-autonomous self parking, front parking sensors, auto-dimming side mirrors, and blindspot monitoring with rear cross traffic alert. 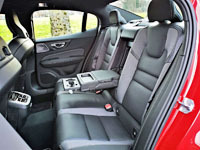 And by the way, all 2019 Volvo V60 pricing was sourced right here on CarCostCanada, where you can find detailed pricing on trims, packages and standalone options for every other new vehicle sold in Canada, plus otherwise hard to get rebate information and dealer invoice pricing that could save you thousands. The only V60 attribute that arguably outshines all of the above is exterior styling, which to my eyes makes it the best-looking sport wagon in the compact luxury D-segment, and possibly the most attractive combination of new Volvo design elements to date. I love the shape of the new grille and the way the headlamps flow rearward over the front fenders, not to mention the motorsport-inspired wing strut design of the lower front fascia. Yet most of all I like this wagon’s profile, culminating at two of the most unorthodox taillights on today’s market, the V60’s sharply cut L-shaped lenses paying obvious tribute to Volvo’s recent past, but all-new and totally unique as well. It won’t be hard for you to tell that I really like the look of this car, and I must admit to liking everything else about it too. It made the recent holiday season all the more enjoyable and helped ring in the first week of 2019 with style, comfort and all-round class.